For starters, yes, gelato is Italian in origin, but their differences go much much deeper. Let’s take a closer look at the real differences between ice cream and gelato. Basically, the key ingredient that differentiates ice cream and gelato is butterfat. Ice cream uses more butterfat and is required to contain no less than 10 percent fat by the U.S. Food and Drug Administration. In Italy, gelato typically contains between four and nine percent butterfat. Of course it’s the other ingredients that really make ice cream and gelato so enjoyable, and the both contain cream, sugar, and milk. Because ice cream contains more butterfat, more crystals form inside the product. These ice crystals will change the texture by making it more firm. Have you ever seen an authentic gelato shop and how the gelato is kind of fluid in the pan? Another difference in texture is air. Because more air is added to ice cream, it is firmer by nature. To compare, ice cream contains nearly 50 percent air by volume, while gelato is closer to 25 percent. To experience ice cream in its most ideal state, it should be stored and served around 10º F. Gelato, on the other hand, should be served slightly warmer. This temperature difference will impact flavor profiles, as well as the ingredients within each product. There are many processes for creating both gelato and ice cream, but for foodservice operations just looking to provide a quality ice cream to guests (or even the home chef who wants a new toy for the kitchen), a good ice cream maker is a must. But which one should you use? Waring produces an ice cream maker that is small and reliable. Stop by the Alto-Hartley showroom to take a look at one of our ice cream maker units. Does your Mid-Atlantic foodservice operation have the right ice cream equipment for the summer? 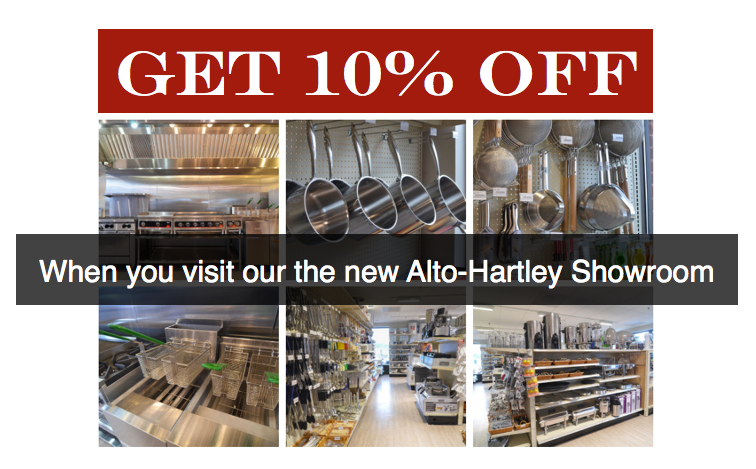 Stop in and learn more in the Alto-Hartley Showroom, open Monday through Saturdays. When you do visit, be sure to bring this coupon below for 10% off your visit.